So here is the next round of Ice Cream Coupon Giveaway? The winning coupons for last weeks Ice Cream Coupon giveaway are just getting ready to ship. So, if you were a winner, you should be expecting them shortly. Entry: Place a comment below and let us know you favorite ice cream topping. You must supply a valid email address. Email addresses should be put in the private field and not in the public comment box. The giveaway ends on Friday, June 24th at 11pm EST. No entries will be counted after that time frame. Definitely mini M&Ms or mini Chocolate chips!! I am a simple girl with simple tastes – Rainbow sprinkles for me! I love Heath bar topping on my ice cream–just the perfect mix of sweet chocolate and salty toffee! My favorite topping is cookie dough! Crushed Oreos and hot fudge sauce – sooooo good! My favorite is crumbled oreos! Chocolate magic shell and raspberry puree! Hot fudge all the way! I love the crunch of the mini M& Ms! Vanilla icecream becomes psychedelic when the colors run off. My favorite is peanut butter sauce and hot fudge!!! Yummm!!! definitely hot fudge and a cherry! YUMMO! Peanut Butter!!! Especially on chocolate ice cream, yum!! Yummy! 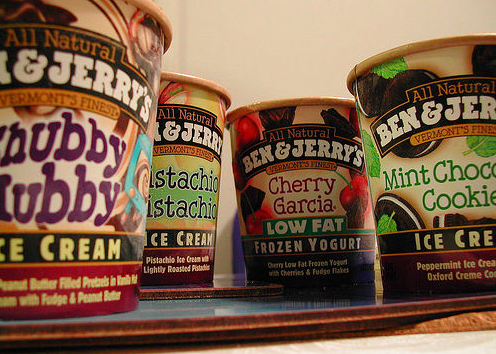 That B&J picture started a craving! My favorite is good ‘ol rainbow sprinkles! My favorite topping is hot fudge-YUM! Tastefully Simple’s Creamy Caramel….omg. OMG. on vanilla. maybe crush a few nilla wafers…LOVE THIS. or…peanut butter…warmed in the microwave and poured over vanilla or chocolate….depends on my mood(swing)!!! Chocolate ice cream with peanutbutter and peanutbutter cups. YUMMY!!! I love Chocolate Ice Cream with Mini-marshmallows and sliced almonds. yumm!! I love the liquid peanut butter topping…started when I was pregnant and it just stuck! Oh my favorite topping is chocolate syrup and bananas…yummy! My favorite is hot caramel & whipped cream! favorite topping is crumbled pretzels! My favorite ice cream topping is Reese’s Peanut Butter Cups as well as hot fudge and whipped cream! MMMM! definitely cookie dough and oreo ice cream…yummy!! My favorite is Chocolate sprinkles and whip cream on top of Vanilla Ripple. My favorite is carmel sauce and oreo crumbles! New Mini Reeses! Def hot fudge, not the thin syrup. Lol. My favorite ice cream topping is melted peanut butter and chocolate syrup, yummy!!! Tastes good on every kind of ice cream, but my favorite is on mint chocolate chip : ) Thanks for the giveaway!! my favorite topping is crushed Oreos, hot fudge and whip cream! Peanut Butter and strawberry sauces! I love ice cream – it does not stay in my house very long. My daughter is a bigger ice cream lover than me!!! we eat it with topping or without….doesn’t matter! Our family favorite Ice Cream topping is Shaved (on a grater) Chocolate with hot fudge and whipped cream!!!! hot fudge and caramel sauce!!! Fresh Strawberries and whipped cream for me! Love all the sweet candy toppings but during strawberry season nothing like strawberries & whipped cream over chocolate ice cream- yum yum!! OK, going 0 for 3, maybe this time. Hot fudge is my hands down favorite, add some brownie to it and Nirvana. I love good ole sprinkles and whipped cream! Love marshmallow topping w/ sprinkles & whipped cream! My favorite topping is Hot Fudge…thanks for the giveaway! My favorite topping is caramel and adding some candy like M&M’s, etc. always makes it extra yummy!!!!! Ooooh, ice cream and toppings! I love chocolate syrup, whipped cream, chopped nuts and, of course, a cherry on top! Mmmmmmm, now I’m hungry! My favorite ice cream topping is chocolate ganache (and chopped maraschino cherries with that!). Peanut butter sauce and Peanut Butter cups!! mmmm… now I’m craving it! My ABSOLUTE favorite is a luscious, liquid peanut butter with chopped peanuts, and a cherry on top! 2nd is a Fudgenutter with chopped nuts. As much as I love hot fudge, there’s something about strawberry syrup a la McDonalds that I LOVE! All covered in whipped cream, of course! Mmmm…BUTTERSCOTCH! Topped with whipped cream and Krunch Kote! My total FAV topping is whipped cream and nuts with REESE PIECE’S alllllllll over the top… omg my mouth is watering right now just thinking about it!!! Ha i put my stuff in the comment because the email and name boxes werent showing LOL sorry about that..
My favorite topping is hot fudge & good quality fudge at that! peanut butter sauce…can’t beat that..
My favorite topping is Reese’s Peanut Butter crumbs…Yummy on ANY kind of ice cream!!! 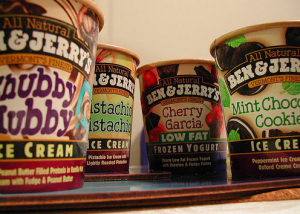 My fave Ben n jerrys is Everything But!! Omg if u havnt tried them together yet, do so and tell me it’s not perfect! Chocolate Jimmies or peanuts are my all time favorite! Crunched up cruchy chocolate chip cookies with Hersey’s chocolate sauce over vanilla ice cream! Yummmmm!! No ice cream sundae is ever complete without tons and TONS of cherries!! Just love hot fudge, whipped cream and almonds or strawberry over chocolate or vanilla ice cream… yummy!!! My favorite topping, at the moment, is Teddy Grahams! Warm Caramel!!! Who could resist?!! My favorite topping has got to be Hersheys dark chocoalte fudge and Chocolate sprinkles!! Anything chocolate. It could be chocolate shell, or chocolate syrup, chocolate sprinkles, or even Oreos. I just love chocolate! Hot fudge is our favorite w/o a doubt! I love peanut butter sauce! My favorite! Hot fudge and homemade whipped cream! I love hot fudge and whiped cream. My favorite ice cream topping is melted peanut butter…..so decadent! My favorite topping is warm caramel! Definitely would have to say hot fudge and almonds!! Wet walnut sauce. Omigosh, so good! Chopped English Toffee bits (aka Heath or Skor bar) is a very close second. Crushed Heath Bar Crunch and caramel sauce…YUM!!! Peanut butter or butterscotch! YUM! clearly Strawberry topping on Vanilla Frozen Yogurt…. I just love Peanut Butter and Pretzels on top!! My all time favorite is chocolate. Strawberry, Hot fudge, and chopped peanuts! Yum! I love Hot Fudge, whipped cream & a cherry on top on my ice cream!!!! I love rainbow “sprinkles”…(I call them “jimmies”) and whipped cream! I love nuts and whipped cream!!!! Delicious!!!! my favorite is peanut butter and pretzels on top! yum!! Salted Caramel Sauce is my favorite! Hot Fudge is so, so good! The all-time greatest is HOT FUDGE! Woohoo! My favorite topping is hot fudge, whip cream and a maraschino cherry (or two) on top! YUMMM!! My favorite topping is chocolate sprinkles! Tastefully Simple Caramel sauce with toasted pecan and chocolate chips!!! My favorite topping is peanut butter right out of the jar. Peanut butter turns good vanilla ice cream into a wonderful treat! Chocolate fudge, strawberry topping, banana’s and cool whip! Definitely fresh fruit! Nice ripe peaches or strawberries and raspberries. Peanut butter all the way! With Vanilla Ice cream! I have to say that my favorite is a bit baileys. Oh, this so so hard! My favorite topping would have to be hot fudge. Brings me back to my days scooping ice cream at Friendly’s!! Fresh strawberries and banana. And don’t forget the whip cream. Banana’s and chocolate syrup….. Hands down! My favorite ice cream topping is rainbow sprinkles and crushed oreo cookies!!! Yummmmy!!! When I’m feeling healthy, fresh strawberries and bananas. When I’m not, I go for ooey, gooey caramael! Hot fudge and salted peanuts! I love the sweet and salty combination! Definitely the Oreo or the Heath toppings. I’m nuts about nuts on my ice cream!!!! Hot Fudge & marshmallow are my favorite toppings !! I love the combination on hot fudge and beer nuts, but if I had to pick just one solo topping it would be hands down creamy peanut butter. Hot Fudge and homemade caramel! Yum! To pick just one favorite is a sin as it depends on the flavor of ice cream. However, my 1st choice would have to be whipped cream and nuts. What kind of moderation are you looking for? Oops my comment didn’t have the boxes for name and email. So I’ll retype my comment. I love the combination of hot fudge and beer nuts but if I had to pick a solo topping it would be hands down creamy peanut butter. There is nothing more delicious than topping a yummy bowl of ice cream with crumbled poato chips and a few slices of pickle (no – i’m not preggo). The combination of salty, sweet and tangy tastes like a small scoop of heaven! Hot fudge of course!! An melted peanut butter!! I loooove mocha topping w whipped cream and walnuts! Caramel, baby! It’s soooo good! Im a classic kinda gal….. Colorful sprinkles all the way!!! Hot fudge and peanut butter sauce! cake crunchies!!!!!!!!!!! hot fudge and carmel with a little whip cream. Hot caramel and whipped cream! My favorite ice cream top[ping is hot caramel on soft vanilla ice cream. Carvel has the best but unfortunaltely the one near my house closed. Good for the waistline I suppose. A real, homemade hot fudge topping (none of the warmed hershey syrup) is the best topping there is. Hot fudge with coconut crunchies and sprinkles. My favorite topping is hot caramel on soft vanilla ice cream. YUM! Peanut butter and hot fudge with chopped nuts! Yummy! Depends on the type of ice cream I’m having… but whipped cream and walnuts goes with anything! I love hot fudge topping! Hot Fudge, marshmallow, and crushed Oreos. YUM! Caramel on top of B&J Clusterfluff ice cream. YUM! Melted peanut butter and nuts! Mmmm. Fresh fruit on vanilla ice cream! Cold Ice Cream on a Hot Summer Day! Can’t wait to go to Shoprite! Bananas and vanilla wafers! OMG. love hot caramel and whipped cream. My favorite toppings would be hot fudge with reese pieces and of course whipped cream!! My favorite ice cream is Mint Chocolate Chip and my topping of choice would be hot fudge with crushed oreos. My favorite toppings are cherries, whipped cream and sprinkles. Love chocolate ice cream. Hot fudge is the best! My favorite ice cream topping is crushed oreos with caramel! Yum! I love coffee ice cream with dark chocolate syrup and chocolate sprinkles. All I ate when I was pregnant. I love sprinkles and they have to be rainbow! A must have topping, Caramel with chopped almonds!!!! I am a chocoholic…chocolate syrup, chocolate sprinkles, and brownie pieces all the way!! Chocolate chunks and whipped cream!!! Peanut Butter melted (not pb sauce). Yum-Yum! I love, love, love vanilla ice cream with cherry juice and chocolate syrup. Then, I let it melt a little bit and mix it around…MMMMM It’s like having chocolate covered cherry soup! So good. I love real hot fudge from an ice cream shop. Black Raspberry is my favorite! Hot fudge and whip cream! Yum! Whipped cream & hot fudge! Yum! my favorite topping has always been good ole Hershey’s chocolate Syrup on Vanilla icecream. 🙂 Mix it up! I have recently discovered my daughter and I love the Cinnamon Chex Cereal on top of our ice cream! Whipped Cream, Peanut Butter Sauce and a cherry on top!!! banana, chocolate chips and wet walnuts!! Yum!! My favorite topping is HOT caramel with crushed toffee pieces!! Its to die for! Marshmallow, peanut butter & hot fudge on chocolate ice cream – sprinkle reeses pieces on top – yum yum! Chocolate magic shell (that hardens), any kind of crushed toffee chocolate bar, a drizzle of caramel and whipped cream! Mmmmmmmmmmmm…. I love chocolate sauce with receese peanut butter cups ! ! ! Yummy ! Can never have too much chocolate ! Yippee for ice cream ! ! Sprinkles, hot fudge and whipped cream! My favorite topping whipped cream! I will cover the entire bowl with it! Hot fudge all the way…YUM! I love hershey’s chocolate syrup! Peanuts, Almonds, Brazil Nuts and Hot Fudge! Gummy Bears and CHocolate chips!!!! I love walnuts or pecans on my ice cream. Everything!!!! : – ) Hot Fudge, Caramel, Chocolate Chips, Sprinkles, Whipped Cream, Cookies, M&Ms, Magic Shell – I could go on and on but seriously, everything! Melt butter then add all ingredients (except kayro) bring to a boil on medium low heat. When it starts to boil take off the heat and add kayro- then pour over ice cream! So good! Caramel, whip cream and prailines. Hot fudge and any kind of nuts! geez this is torture reading about ice cream and toppings when I’m on a diet 🙂 My favorite toppings are hot fudge and peanutbutter sauce. yummm! reese’s magic shell soo good! Marshmallow, whipped cream and purple sprinkles!!!! Hot fudge and colorful sprinkles! Chocolate syrup or hot fudge and whipped cream! Chocolate syrup with some almond slivers and banana chunks. Gotta have whipped cream and a cherry(or two). Love caramel sauce with wet walnuts!! Cherry syrup (lots of it) is best with vanilla. Salty peanuts too! Peanut butter sauce, and hot fudge!!! I love peanut butter and hotfudge sauce on my ice cream! Love butterscotch topping on my ice cream. Current fave ice cream is moose/bunny tracks (depending on the brand of ice cream you get). Hot fudge, Melted peanut butter & whipped cream. YUM!!! Hot Fudge, Hot Fudge, Hot Fudge!!!! My children and myself love chocolate rice krispies on our ice cream, nice crunch and I feel a little better about the calories!! I love strawberry and blueberry syrup and whipped cream topping with sprinkles!!! yumm yummm yummmm!!! I love chocolate syrup. Especially when I pour it over chocolate ice cream. It’s not only a chocolate overload, but the combination just seems to melt all those problems away on a stressful day. I love peanut butter sauce mixed with fudge topped with cool whip. I love my ice cream plain without any topping!!! I love hot fudge and whipped cream! It makes any bowl of ice cream delicious! Yum! My favorite ice cream is sunday, vanilla & walnuts! Caramel & EXTRA whipped cream…..
My fave topping is caramel sauce…but if I have to share with my kids..I go with pineapple and walnut toppings..less messy and just as delicious!! Either hot fudge or crushed oreos–yum! hot fudge for sure. and real whipped cream. wet walnuts and hot fudge! I don’t have to pick just one, do I? Definitely have to go with caramel and rainbow sprinkles! i love hot fudge and caramel together, yummmm. It is hard to pick just one. I guess I would have to choose Reese Pieces and Whipped Cream!! CARAMEL!! W/ CHOCOLATE CHIPS….AND MORE CARAMEL!! Whip cream, crushed nuts & hot fudge! YUM! I eat my ice cream with hot fudge and M&Ms! it’s delicious! Marshmallow topping is my fav!! Mix that with some fudge and peanut butter and I’m a girl in heaven!!! Oh, now I have to win! Hot fudge and whipped cream with a cherry on top! The ultimate sundae. I like caramel, sprinkles, and whipped cream! With out a doubt, Caramel and chopped peanuts. Warm caramel sauce, wet walnuts and whipped cream….YUM-O!!! Real Whip Creme, Hot Caramel, walnuts, and occurs the cherries. Real Whip Creme, Hot Caramel, and occurs the cherries. Choc. Magic shell is the best!!!! Love, love HOT fudge sauce – YUM! No question about it……Hot Fudge or chocolate syrup! Hot fudge, whipped cream, nuts and a cherry! YUM!!! My favorite ice cream topping is peanut butter sauce! When I make a “sundae” at home, I like to use Breyer’s Vanilla Bean and top it with sliced strawberries and bananas, Hershey’s chocolate syup and granola. Yummy! Sliced strawberries & bananas, Hershey’s chocolate syrup and granola (on Breyer’s Vanilla Bean). Yummy!! I absolutely LOVE butterscotch on my ice cream!!! Lots and lots of caramel !!!! YUM !!!! Love the chocolate Magic Shell!! Love a Dr. Pepper float! Vanilla ice cream w/Dr. Pepper…yum! Crushed oreos, crushed brownies, and cookie dough! Crushed oreos, crushed brownies, and cookie dough, yum! I love the hard shell topping that you get over soft serve ice cream at an Ice Cream Shop. At home I love dark chocolate hot fudge. Pieces of Double Stuf Oreos and Chunks of Fudge Brownies!!!!!! Delish! My favorite is peanut butter sauce and sprinkles!!!!!!!!!!!!!!!! crushed oreo’s with hershey’s chocolate and whipped cream. Yummmy. My favorite ice cream topping is some fresh Georgia peaches! MMM, MMM Good! Chocolate Magic Shell and sprinkles on a hot apple pie! I love the hard shell topping in chocolate. Yum. Love the peanut buster tooping.The kind that they have at dairy queen.With sprinkles.Yummy! When I was a kid they used to top ice cream with this fruit cocktail kind of sauce it was so good on chocolate ice cream! anything with peanut butter crushed peanut butter cups are good.. the best is crushed peanut butter crackers. yum! i usually go for chocolate syrup and maraschino cherries, but i’ve recently discovered how fun and yummy sprinkles can be with ice cream (c/o my 3 boys). i’ve also got a fondness for the chocolate hard shell topping, we always had that at my grandma’s house. I love hot fudge on vanilla ice cream on top of a warm slice of brownie! Now if I don’t have that, I like the Heath hard shell. Love the ben and Jerrys chubby hubby ice cream. So yummy. I would have to say Caramel, Whipped Cream & marachinno cherries. Yum!! Thanks for the giveaway! Favorite topping. Me and a spoon. Even thought I’m Wendy when it comes to ice cream I’m a plain Jane. UNLESS the topping is another scoop of ice cream. My favorite combo of toppings : salted roasted pecans, hot fudge, hot carmel, and a few slices of banana! Peanut butter, pretzels and wet walnuts!!! I love some cookies and creme and chocolate chip cookie dough!!!! I Love Love Love Hot Fudge!!! pecans ..hot fudge …and coconut just a little bit of heaven ! I love Caramel topping with nuts and whipped cream! My favorite topping is Whipped Cream and lots of it!! My favorite is coffee ice-cream!! my favorite topping is HOT FUDGE!!! Thanks! Peanut Butter Sauce:) Yum Yum oh and Whipped Cream! My absolute favorite ice cream topping is warm, gooey peanut butter sauce! My favorite toppings for more than 20 yrs are Reese’s peanut butter cups with hershey chocolate syrup and…why not…whipped cream! My favorite topping is caramel! For an adult dessert, I love a little bit of Ameretto on top of vanilla ice cream.. For everyday dessert I love Hersey’s magic shell! Rainbow sprinkles. It’s crunchy sweet happiness! I absolutely cant live without rainbow sprinkles and they have to be the chewy ones like the ones from the soft serve ice cream trucks…oh and we cant have ice cream without chocolate syrup..yummy!! My fave topping is caramel and wet/glazed walnuts…yummmm!! my favorite topping is hot fudge! I love caramel and chopped peanuts on softened vanilla ice cream. YUMM!!! Anything that has chocolate in it has to be good!!!!! love hot fudge and sprinkles!!! I love just about any kind of toppings, nuts, whip cream, chocolate, carmel, oh and of course a cherry on top. My favorite ice cream topping is caramel!! YUMMY!! Hot fudge and lots of it! I love hot caramel on ice cream. My favorite ice cream topping is McD’s french fries! Ha ha! I’ve been dipping them in vanilla soft serve ice cream since I was a kid! If we are talking about hard ice cream, then hot fudge… mmmm…. although please— no one tell me how my Weight Watcher points that is!!! Considering I am 8 and a half months pregnant I LOVE almost ALL ice cream toppings, but my all time favorite is the all original HOT FUDGE!!! My favorite ice cream topping is wet walnuts!! YUM! Hot fudge with cool whip! Hot fudge is my favorite! My favorite ice cream topping is peanut butter sauce and rainbow sprinkles. My favorite is Strawberry topping with fresh Strawberries. My favorite topping is maple syrup walnuts!! My favorite ice cream topping depends on the flavor of ice cream. For chocolate i love FLUFF! Mmmmm Reese’s Peanut Butter topping, with Magic Shell, and of course, whipped cream! I love caramel with butterfinger chunks!!!YUMMY!!! Hot Fudge, bananas and walnuts YUMMM!! Chocolate Fudge Magic Shell with Chocolate sprinkles. Delish! Hot Fudge, Bananas and Walnuts!!!! My favortive Ice cream topping is fresh sliced strawberries! !…or crushed reeses peanut butter cups!! my favorite would have to be hot fudge!!! My favorite topping is chocolate, peanuts and whipped cream. Whipped cream. You can’t go wrong with real whipped cream. I just had my favorite of Black Rasberry Ice Cream with Chocolate Sprinkles, however, my BF just ate the other night Chocolate Ice Cream and this ice cream location had the Crunchies in a Carvel or Turkey Ice Cream Cake, there was nothing better! I love hot fudge over vanilla ice cream. Cappuccino Crunch and Rocky Road are my favs!! I hope I win! Yummy hot fudge is my favorite…. Hot fudge is my favorite topping…yummy!!!! I love melted peanut butter on my ice cream! Hot fudge is my favorite topping…yummy! I love caramel and a cherry! Whipped cream and peanut butter cups! My favorite topping is wet walnuts with hot fudge that I heat in the microwave with warm caramel….mmmmm sooo good. I like to stir my ice cream until it becomes soft….just like when I was a kid. any topping works for me! Toffee or butterfinger and of course ANYTHING peanut butter! My most favorite is strawberries and bananas with whipped cream, though reading the peanut butter of the previous posters is right up there too. MMMMM….ice cream! Love it so much I will pay retail for it. Hot Fudge all the way!! My favorite topping is butterscotch with walnuts and cream….yuuummmmyyy!! if its a cone the chocolate “dipped” magic shell like coating! if its a cup most likely hot fudge! I love to add whipped cream and chocolate syrup. Yummy! Ahhhh Ice cream!! No matter what time of year it is, eatting it brings me right back to being a kid again. Truly one of life’s simple and fantabulous pleasures! Hot fudge, whipped cream, and a cherry! Sometimes sprinkles too! At home the Magic Chocolate Shell is divine! Crumbled graham crackers, chocolate chips, and a little marshmallow cream….yummy. I better go make some now! Hot Fudge, and peanuts…yum! But the best topping of all? The one’s that go on FREE or SUPER CHEAP ice cream! Yea! My favorite topping is sliced bananas. Hot caramel and whipped cream!! Walnuts in syrup or pecans! I love coffee ice cream with fresh sliced strawberries and hersheys dark chocolate syrup. YUM YUM!!! Any chocolate and hot fudge especially!! Oreo cookie crumbs and hot fudge go perfect with whipped cream and a cherry (or two) ! My favorite ice cream topping is PEANUT BUTTER and PEANUT BUTTER CUPS!!! Ready to receive some coupons!! Caramel with nuts! Mmmm! Mmmm! Good! I can’t choose just one. I love oreo’s on ice cream But I grew up eating walnuts in heavy syrup and cherries. Mmmmm. I loved it when I was a kid. You didn’t have to worry about fat then. LOL. Have a great day everyone!!! I love hot fudge and caramel sauce! Summer + Ice Cream + Home with the kids all summer = FUN, FUN, FUN! Depends….sometimes Chocolate icecream with chocolate syrup, or vanilla ice cream with Caramel, sometimes chocolate with marshmallow AND caramel…. banana & walnut… Love it, Love it. I love whipped cream and anything else you can put on ice cream. I am a sugarholic!! Hot fudge – with a cherry on top of course!! Hands down vanilla ice cream with peanut butter topping and of course whip cream and cherries! Crunched up Heath Bar is my favorite! My two favorite ice cream toppings are granola, and nestle quik power form just sprinkled over vanilla ice cream! I love maple syrup on my ice cream! CHOCOLATE MAGIC SHELL!!! !mmmmmmmmmmmmmmmm, has to be the GREATEST thing to top ice cream EVER!!! My favorite ice cream topping by far has to be crushed Heath Bars! YUMMY! My favorite is Oreo, and hot fudge!! MMM MMM MMMM! Chocolate, caramel, chocolate chips, fresh fruit…crushed up candy bars! yummm! Magic Shell! Nutella is a close second. Nesquick sprinkled on vanilla ice cream! Reesea pieces and hot fudge! black cherries and whipped cream! vanilla ice cream with peanut butter!!! Just scoop more ice cream on top that is good enough for me.. I LOVE CARAMEL AS MY TOPPING FOR ICE CREAM. YUM. Has to be pineapple topping on chocolate ice cream!